Some people like to kick back and take it easy during the holidays. That’s why so many blogs fill up space with lists like 2010’s Top 10 People Named Dave or whatever other silliness they wrote two weeks earlier. So, for their last segment of the year, Jansing & Co. had a little fun, bringing in body language expert Lillian Glass to explain the importance of that perfect New Year’s Eve kiss. Unsurprisingly, the segment got fairly goofy fairly quickly until it just devolved into discussions of the various guests’ romantic techniques and a talk of how “awesome” Cory Booker is. The jokey from the start piece just dropped all pretentions once Chris Jansing tried asking everyone about a poll stating more women than men would consider bad kissing to be a deal breaker. When she tried asking Salon’s Steve Kornacki if he would ever dump a woman over her kissing style, he sheepishly admitted that he’d more likely be on the other end. 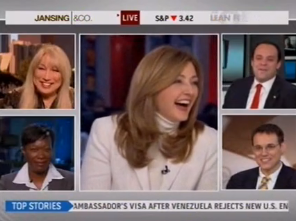 Soon Jansing was threatening to call up his ex-girlfriends to get the deets while Boris Epshteyn excitedly talked up all the “nice ladies” that Kornacki would be hanging out with tomorrow night. Then everyone compared notes on whether or not it’s cool to dump someone over Twitter.